I believe it is nice to start the weekend with a beautiful looking breakfast. We often say in Portugal that the eyes eat too. So this week I decided to play a bit with colors and flavours and make something simple to balance my stressed out week. It just had to follow these rules, be tasty, healthy, energetic and look good. I was inspired by a recipe of Carmen Fernandez. 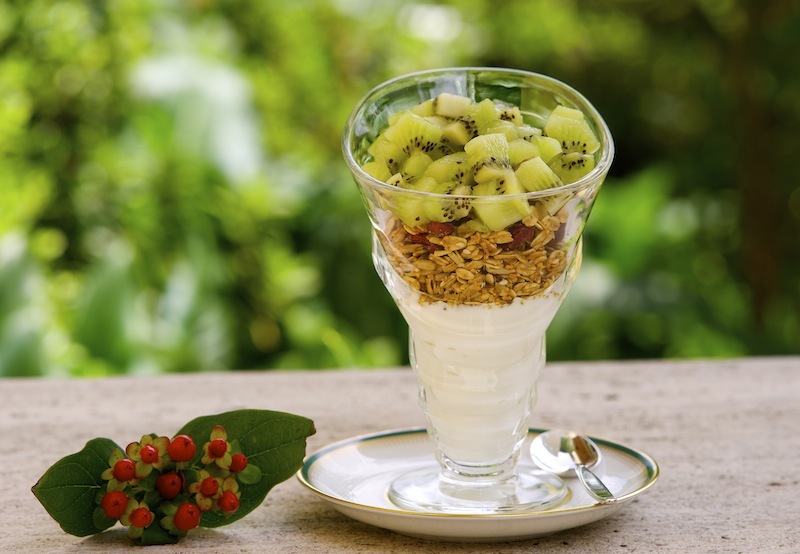 The coconut flavour of the yogurt went nicely with the granola, the seeds and the dried fruit. The freshness of the kiwi added acidity to balance the sweetness of the other ingredients and much needed vitamin C for my slight sore throat. 1 cup granola: pumpkin seeds, sesame seeds, sunflower seeds, flax seeds, dried fruits like cranberries, apples, peaches. You can make your own or use a store bought granola with natural ingredients. Beat the yogurts and divide them among the glasses or bowls. Place the layer of granola on top. Peel the kiwis and cut them into very small squares. 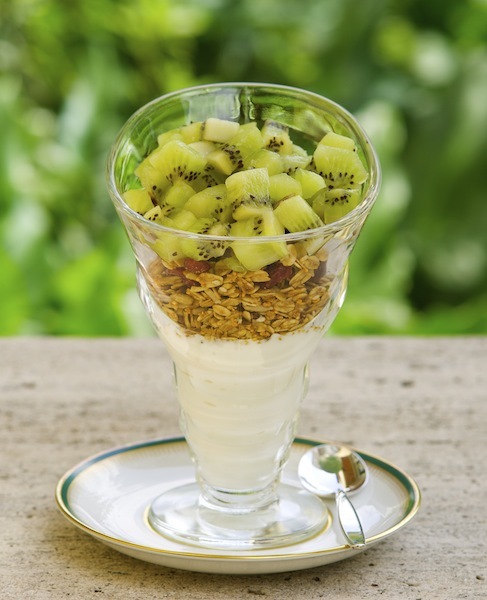 Divide the kiwis between the glasses or bowls and put them in the fridge until it is time to serve. Serve chilled. There is nothing like sitting in the garden early in the morning, appreciating the cool air, observing the squirrels trying to steal the last figs of the tree and just being grateful to have and share these special moments. Me encantó, sobre todo el observar a las malvadas ardillas robándose los últimos higos.